With over 320 options to choose from, our range of fabrics for roman blinds are ideal for combining beauty with practicality. Available with standard or black out lining for extra light control, roman blinds are the modern alternative to curtains. In our day it’s new popular trend in interior design. Roman blinds can be used for decoration, not only housing, but also office space. These accessories are beautiful and easy to use. They are wonderfully fit in the room with the most different designs. Their main feature is that they can perfectly fit into such an interior, where other blinds did not look or agree, pretty boring ordinary curtains and lackluster. If you want to use blinds in offices, as for Roman blinds, they will create a modern and very original interior. True connoisseurs of beauty and elegance has long appreciated them. Roman blinds – a choice in practicality and beauty. 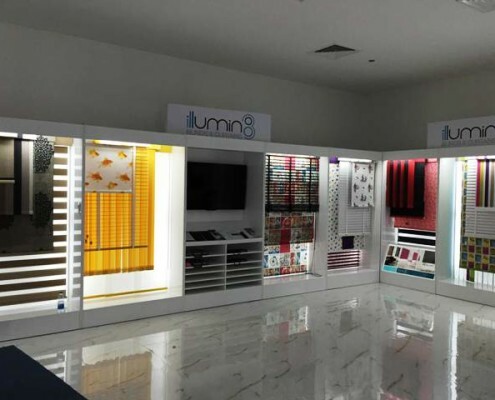 We are based in Dubai and we have over 320 soft fabrics to choose from to make beautiful blinds for offices. 1. Roman curtain is incredibly easy to use at Dubai, since the web can be easily removed and washed his hands. They will not interfere with opening windows and combined with any other curtains. They can be used in the interior and for any purpose – such paintings hung in the bedrooms and in the kitchen, and a large hall. 2. This kind of cloth sewn from a variety of tissues. Some of the materials are thick and curtain materials, and light tulle, depending on the purpose of usage at the climate of Dubai. 3. You can use the combined combination: sewn from heavy fabric curtains for the lower layer and the overlay on top of organza. In the photo you can see such curtains installed at Dubai- they look very impressive, especially on the plastic box. 4. When choosing colors for your offices in Dubai; you should take into account a variety of colors, but also need to remember that a large pattern will not look good at the expense of creating a horizontal folds during lifting. 5. Roman curtains impregnated with a special compound to protect against UV radiation, dirt and dust that are common in Dubai. Such webs will not be deformed and fade in the sun. Roman curtains are the ideal solution for owners of practical, in search of an elegant and pragmatic solution to the problem annoying street lights and solar rays. Due to the long history of existence of this type of decoration, it is becoming easier in terms of installation at Dubai and use in the interior, because the attachment is always given in the kit. Do You Need Roman Blinds at Your Office?